Reviewing business names ideas to choose the right one for you is very important. 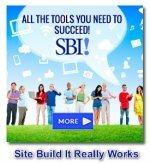 Are you setting up for online business? Choosing the right domain name for your small business can create brand recognition that will serve you well as your business grows and expands. It's usually a good idea to incorporate your business name into your domain name, when possible. If you don't already have an established offline business, it makes the process even easier, in my opinion. When you purchase a hosting package for your online business, check to see if your domain name is already included before paying for it separately. 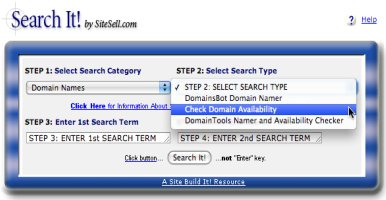 My favorite small business web host (SiteBuildIt) includes not only the domain name and hosting, but all the tools needed to build a profitable online business. When thinking about a small business names ideas, it's best that your domain name accurately reflects the overall theme of your content. Choosing the right keywords related to your business for your domain name and each page of your website makes the difference between being found quickly on the Net or not being found at all. Google (currently the largest search engine) considers hundreds of factors in its ranking algorithm (which determines how high your site is found in the search results). One of these factors is the relevance of your domain name in relation to the content of your site. Because of this, your Site Concept keyword is highly recommended to be a part of your domain name (business name). But don't fool yourself into thinking that this alone will be the main determining factor in the ranking position of your small business website. Having your Site Concept keyword in your domain name can help drive a bit of traffic but name is only one of hundreds of factors that Search Engines use for their ranking criteria. No matter how little the name counts in eyes of Google (not only) spiders, choosing the wrong name may be the first and the most fatal mistake. Your Small Business Domain name is the main door of your overall business whether local or globally. Meaningful - communicate a clear message. Contains your Valuable Content Proposition for human visitors. Contains your Site Concept keyword for spider visitors. Attractive to humans (ex. 'rent-a-villa-in-tuscany.com', 'tuscany' is there for the SE and 'rent a villa' is there for humans). Ends with '.com', '.net' or '.org' (the best for small business websites). Following these simple rules will increase your branding marketing value. Your domain name helps visitors to recognize easily what your site is about. Generally speaking, try your best to have your Site Concept keyword in your domain name (Tuscany), with a marketing word that establishes your Valuable PRE-selling Proposition (rent a villa in Tuscany). To find out if business names ideas you're considering are still available, use this handle little tool called Search It. First you can check to make sure that your favorite choices are available. Secondly, make sure that the business names ideas you like are legal. 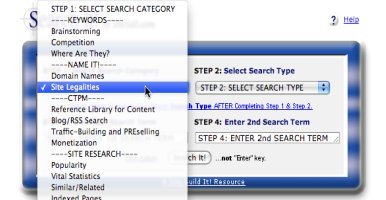 To do this, choose the Search It site legalities category. Stay away from legal problems before they happen! Simply select the Site Legalities category (shown below) and then pick the Trademark Check Search Type! What About Using Dashes In Your Domain Name? You may notice that I've used dashes in some of my domain names, like www.chocolate-candy-mall.com. Using Dashes in your domain name often makes them easier to read, particularly if there are more than two words involved. Humans and Search Engines will both find it easier to quickly determine your business name and what your site is about. For example, which is easier to read? Dashes are less important if your domain name has only two words in it. See how globalbusiness.com or angieberg.com don't really need dashes to make it easy to read? Dashes are a good find also when the non-dash version has already been taken. So, don't make the mistake I did when I started my first online business. If both versions are available, buy them both! If you build brand recognition around one version of your domain name but don't purchase them both, someone may buy the other and take advantage of your hard work.